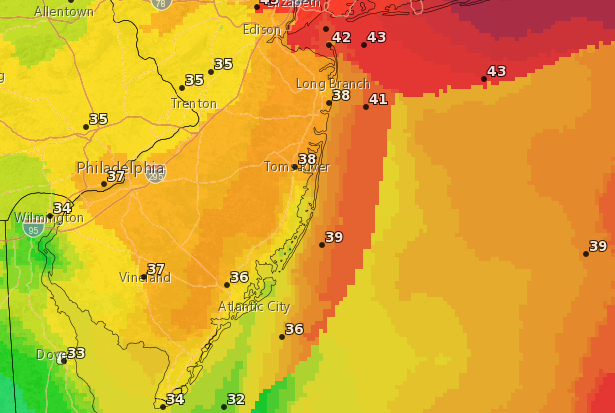 Shore residents should be prepared for rain, heavy at times, on Friday night followed by an especially windy Saturday. A wind advisory is in effect from 11 a.m. to 6 p.m. Saturday, according to the National Weather Service. West to northwest winds of 20 to 25 m.p.h. with gusts around 45 m.p.h. are expected. The strongest winds will be during the afternoon hours on Saturday, the advisory said. Before the winds pick up, rain and thunderstorms will move in before 8 p.m. Friday night. Some of the storms could produce heavy rain, and winds could gust to 29 m.p.h., the NWS forecast says. An inch to two inches of rain is predicted to fall – mainly between 8 p.m. and 2 a.m. – with showers lasting into Saturday morning. Saturday will begin with a few showers and gradually clear during the day with a high of 59 degrees, the NWS forecast said. The winds will die down overnight, and Sunday is forecast to be sunny with a high of 54 degrees and north winds 5 to 9 m.p.h.